Embroidered and stitched decoration on fabric is one of the oldest art forms in the world, vying with ceramics for that honor. Davis Art Images recently acquired digital images of works of art from The Library Company of Philadelphia, a museum started by Benjamin Franklin! 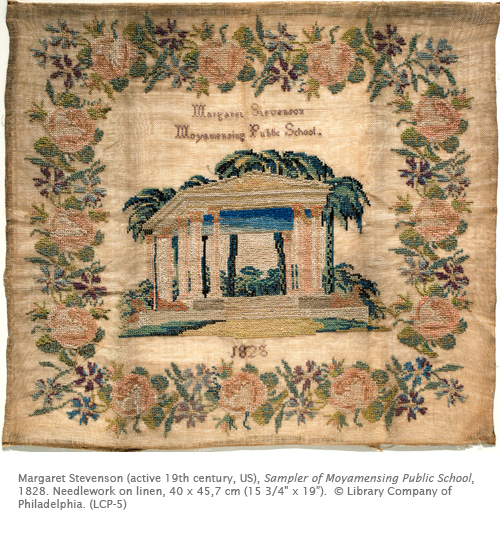 One of the works that charmed me the most was this beautiful sampler executed by a school girl in 1820s Philadelphia. I’ve always found samplers fascinating as documents of particular periods in history. I bet there’s a lot most people don’t know about the genre, especially its long history in art. Since ancient times, artists have decorated textiles with embroidery, cross-stitch, and various other kinds of stitches. The word “sample” comes from the French éxamplair, meaning a model pattern to copy or imitate. This evolved by the 16th century to saumpler, exemplar, or sampler. Early samplers were often thin bands meant to be decorative borders on various household textiles. The art form was practiced not only in Western Europe, but also in Asia and the Middle East. Patterns from the Middle East influenced European samplers. Before the 15th century, most patterns were passed down from person to person. With the rise of the middle class in the 16th century in Europe, there evolved the demand for pattern books, the first of which was published in 1523 in Augsburg, Germany. Early sampler artists were both men and women. Indeed, the art of embroidering fabric was such as prized art that guilds formed. The embroidery of material was also an art form that could be practiced at home more easily than painting or sculpture, and so became a popular expression for women artists. Samplers were often listed in royal inventories as items of greatly appreciated value. The earliest known American sampler was produced in the Plymouth colony in 1645 by a woman named Loara Standish. During the 19th century, the genre of the sampler was largely redefined in America as the province of women, an “appropriate” way for young women to learn important sewing skills for household needs. Already in the 17th century samplers had become small, embroidered pictures, commemorating family events, combinations of intricate decorative motifs, religious subjects, or repetition of numbers and letters as writing practice. Embroidery was often referred to as “handwork” or simply “work,” indicating that it was a way of keeping young women busy in a useful project. Such samplers were often proudly displayed in frames as signs of accomplishment and status. Margaret Stevenson’s sample is a combination of the embroidered picture type, and the decorative border that characterized the earliest sampler work. Both the building (indicating the influence of Neoclassicism, such a popular style in the early American republic) and floral border are executed in the cross-stitch technique, which was almost universally used in American samplers. Activity: Plan a border design for an embroidered art work. Make a printing stamp from clay. Create a small block of clay, and carve a design into one side. On a pad containing ink or paint, press the stamp into the ink and then press it on a sheet of paper, imitating an embroidered border from early samplers, or such as the floral border in the sampler discussed above. Be sure to carefully plan how the pattern should appear on the paper. Try using two or three different colors with the same stamp. Nice blog,will come back soon !